During the construction of the original wooden hotel, there was a big error from the contractor. A room was built with no windows or doors, a fact that wasn’t ever shared with the hotel owner. The room was only discovered after a fire broke out in 1926. Since then, apparitions are often seen roaming the hall outside this room. This room was reportedly the scene of a tragic murder of a family. Its door has since been bricked up and made to look like the rest of the wall in the hallway. Guests have reported seeing apparitions outside this room, possibly members of the family that were reported to have been murdered here. Stories suggest a woman dressed in her wedding gown lost her life on the staircase. There were candles on the staircase when the bride was walking up them, when suddenly her dress caught fire, in a panic she tripped and fell down the stairs, dying from a broken neck. Many people have reported seeing her ghost in full wedding gown, often dancing in the ballroom. Guests and staff have in some cases witnessed the flames from her dress as she dances. Others have witnessed the woman on the staircase where she lost her life. Staff have also reported strange noises coming from the bridal suite, even when the suite is vacant. 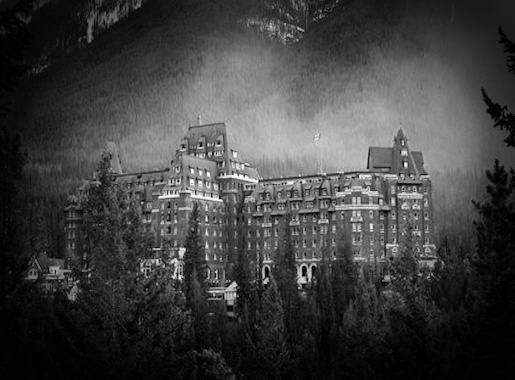 Perhaps the most popular of all the ghost at the Banff Springs is Sam Macauley. He was a bellman at the hotel in the 60’s – 70’s. Although not much is known about how or where he died, his ghost is said to haunt the hotel to this day. He has been known to appear in his 1960’s uniform, helping guests get into locked rooms, turn on room lights, or help with carrying bags. He often witnessed on the 9th floor. If you try to start a conversation or attempt to tip Sam, he will vanish. As well as the more popular reports above, the hotel has a little more to offer too! The apparition of a bartender has been witnessed by staff and guests alike, often informing guests that they have drank a little too much and perhaps it’s best of they go to bed! Perhaps more spectacular is the apparition of a headless man playing the bagpipes! The Banff Springs Hotel in Alberta, Canada, was built in 1888, and was originally a wooden structure. It was built out of necessity when the Canadian Pacific Railway (CPR) stretched westwards, a high class hotel was needed for people travelling along the root. The Vice President of the CPR [William Van Horne] saw the hotel not only as a stop off point, but also a world class travel destination. With its breathtaking mountain scenery and natural hot springs, it had a lot to be proud of. There was a major fire in 1926 that completely devastated the building, and a complete reconstruction was carried out. The new construction was to be loosely based on a Scottish castle, with the towers and stone walls. The Banff Springs enjoyed an upsurge in popularity in the 1930’s, when celebrities and royalty began flocking to the hotel. It quickly became known as the Castle of the Rockies. Surrounded by pristine wilderness, snow capped mountains, and magical lakes, the Banff Springs is truly one Canada’s most majestic hotels. As well as world class surroundings, the hotel also offers world class service and amenities. Its 768 guest rooms are all superbly appointed, with cozy rooms tucked away in the quiet corners of the castle, to the open suites overlooking Alberta’s mountain-tops. The Banff Springs offers a vast array of activities for all seasons including downhill skiing, cross-country skiing, dog sledding, snow shoeing, skating, 27 hole championship golf course, hiking, fishing, river rafting, horseback riding, and lots of other exciting activities. It caters for families with a wide choice of activities for children, as well as kids clubs, menus, and babysitting. If you want to relax after a long day, there is the Willow Stream Spa that’s located in the center of Banff Springs. There are a number of places to choose from to enjoy a sit down dinner or to grab something quick. There’s also lots of choice in cuisine, with restaurants offering Canadian, Italian, Bavarian, Japanese and health conscious meals. As well as the large choice of restaurants, the hotel also offers a choice of places to have a quiet drink, with pubs and bar/lounges. There’s a wealth of activities available when staying at the Banff Springs. There’s a variety of snow based activities with access to some of the best ski slopes in Canada. There’s also a championship golf course on site, and the surroundings offer a vast array of activities, such as fishing, hiking, horseback riding and more. Just steps away from the hotel is the authentic mountain town of Banff, Alberta. Enjoy year-round Banff – Lake Louise events and attractions, local galleries and museums, the Banff Gondola and mineral-rich hot springs. Rooms available from approx $200 per night. However, price may vary depending on availability. To check availability now click here.